The attached Excel sheet is having a chart of voltage (V), current (A), and power (VA) for a certain Power Factor. With this chart it will be easy to see and to understand what happens to wave of alternating current, the voltage wave, and power wave, for a given power factor. Download and open the attached Excel file, then input power factor in the yellow cells, power factor values ​​range from 0 to 1. The best value or ideal condition is where the power factor equal to 1, the worst condition is power factor equal to 0. For a generator set, unless it is writter, then the power factor can be considered to be 0.85. High power factor will lower generator set fuel consumption. The relationship between power factor, efficiency, voltage, current, and power, can be read here. 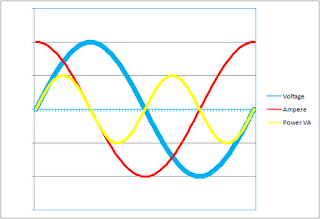 Power factor improvement by capacitor is described in a separate article. 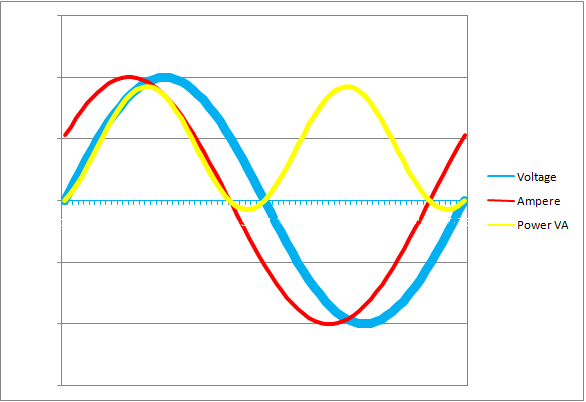 Chart of voltage phase (blue) has different phase with current phase (red) by 90 degrees. 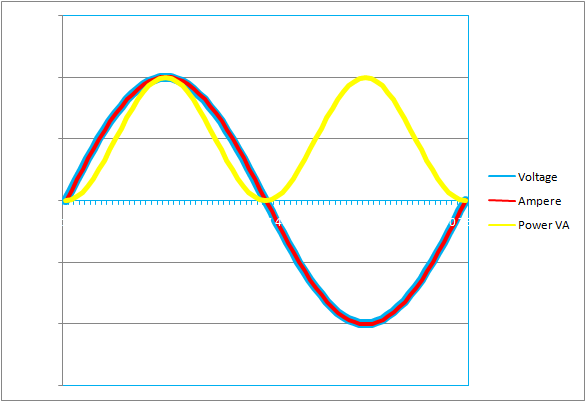 While power chart (yellow) is partially (50%) above the x axis, and partly (50%) below the x axis, so that the power in watts is 0 (zero), while the power in VA (voltamperes) is equal to voltage multiplied by current. 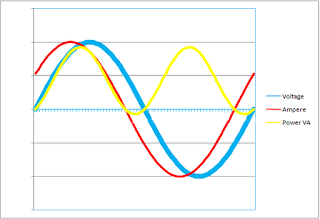 Voltage chart (blue) has different phase to current chart (red) by 32 degrees. And power chart (yellow) has some part below the x axis, therefore power in VA (voltamperes) is greater than the power in watts, or voltamperes = 0.85 watts. 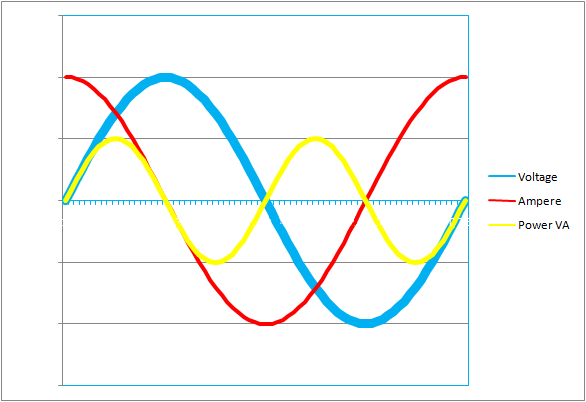 Phase of voltage (blue) coincides with the current phase (red), while power chart (yellow) is always above the x axis, then power in voltamperes is equal to the power in watts.